Why has the integration of women into Congress been so slow? Is there a "political glass ceiling" for women? Although women use the same strategic calculations as men to decide when to run, the decision regarding where to run is something else. While redistricting has increasingly protected incumbents, it also has the unintended consequence of shaping the opportunities for female candidates. The political geography and socio-economic profile of districts that elect women differ substantially from districts that elect men. With data on over 10,000 elections and 30,000 candidates from 1916 to the present, Palmer and Simon explore how strategy and the power of incumbency affect women’s decisions to run for office. Breaking the Political Glass Ceiling is the most comprehensive analysis of women in congressional elections available. 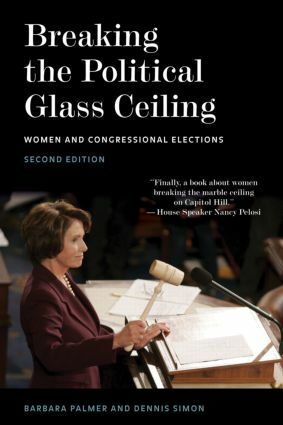 The Second Edition is fully updated to reflect the pivotal 2006 mid-term elections, including Nancy Pelosi’s rise to Speaker of the House, Hillary Clinton’s bid for the presidency, and a record number of women serving as committee chairs. Additionally, the authors have created a website, found at politicsandwomen.com, to highlight key features of the book and provide updates throughout the election cycle.